This was a brief few days of hiking in July…it was challenging and satisfying. 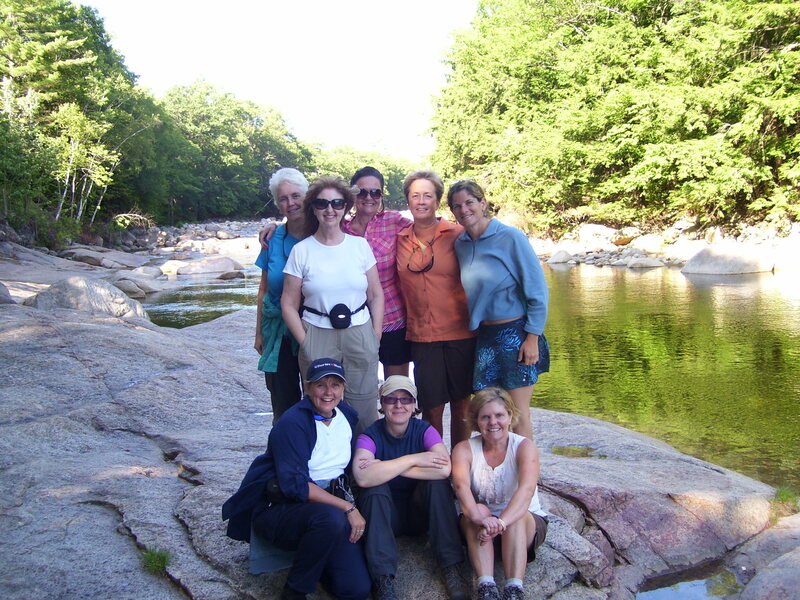 Our group consisted of 8 women and two guides; some of the women had not been on a group hike before, some were looking for people to travel with, and some, like me, just wanted to hike! Our little group consisted of our guides Jan and Ruthie; Anni, Australian from Brisbane; Rebecca from Canada; Ann, Cindy (whose room I stole), Deb, Susan, Debbie and me. Deb drove Susan (who’d never been on a group hike) and me to the starting point, which we needed to reach by noon. 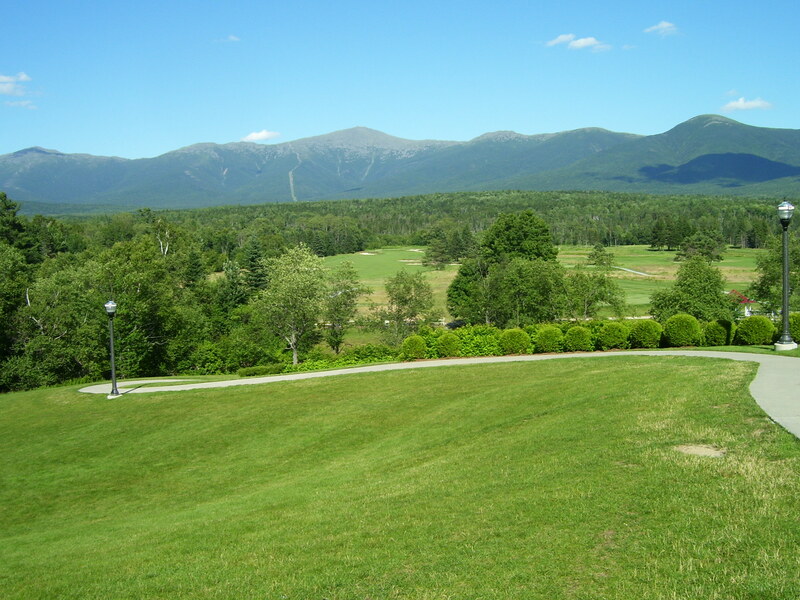 We got to the White Mountains Visitor Center in Lincoln, NH off the Kancamagus Highway (try saying that very quickly) where we had a quick picnic lunch. After picking up the condo keys from Loon Reservations (love that name), we all drive to drop off various and sundry cars at the condos/lodges – then beaver on to the first hike of the trip – to Upper Greely Pond, where we experience the variability of the trail… rocky granite paths and leaf-lined walks…of the mountains. 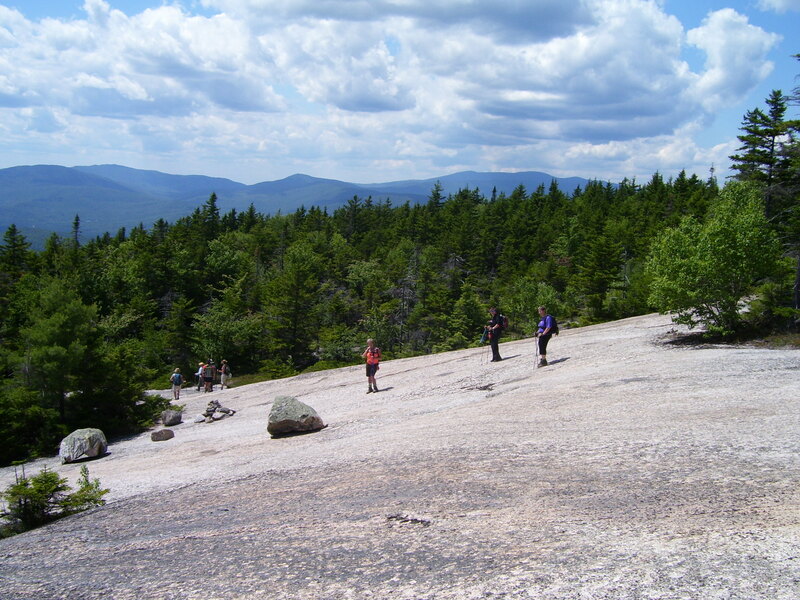 The weather is glorious…warm, dry, cool breeze, vivid blue skies…perfect for hiking (around 3.5 miles round trip). 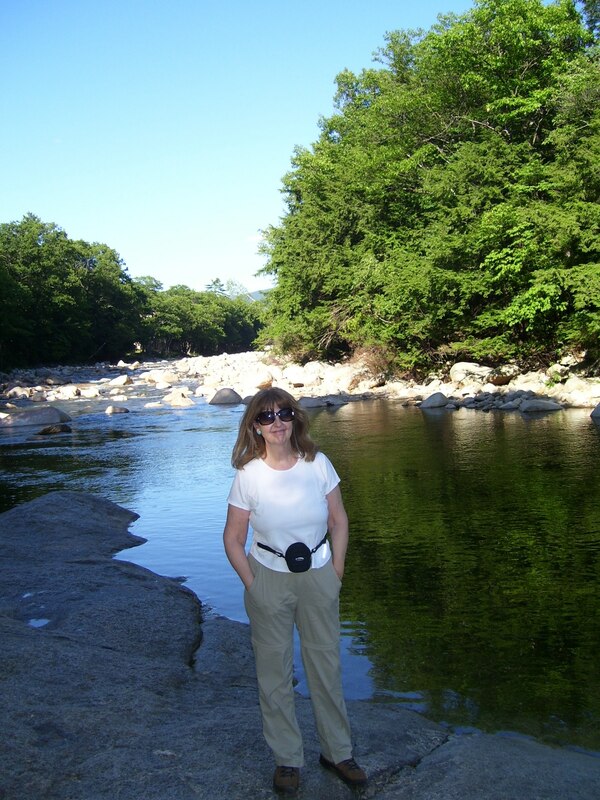 We hiked over rocks, streams, tree roots, marshy ground – seeing all kinds of flora and fauna. The trail was beautiful: between the trees are moss-covered boulders that make me think of Wales, where I lived when I was a child (at the base of a mountain). Ferns lined the trail, and lichen covered trees and rocks. The air smelled of pine as we climbed upward to Greely’s Pond, where Susan was the only one to take a dip in the chilly waters. The sun was intense and very soporific. After Susan’s swim and various snacks all round, we hiked back down the trail…I have to say my feet were feeling it by the time we got to the car and back to the condos. The condos are set back in the woods…pretty (although they don’t match up to the lodge we stayed at in the Smokies last year.) But Jan is great…it’s super having her as our guide again. She and Ruthie prepared a wonderful meal in the condo, and after a long discussion about upcoming hikes, I was pooped – and so to bed to be ready to get on the trail by 9AM tomorrow. A really long day – up at 7 – breakfast at 8 – leave at 9. 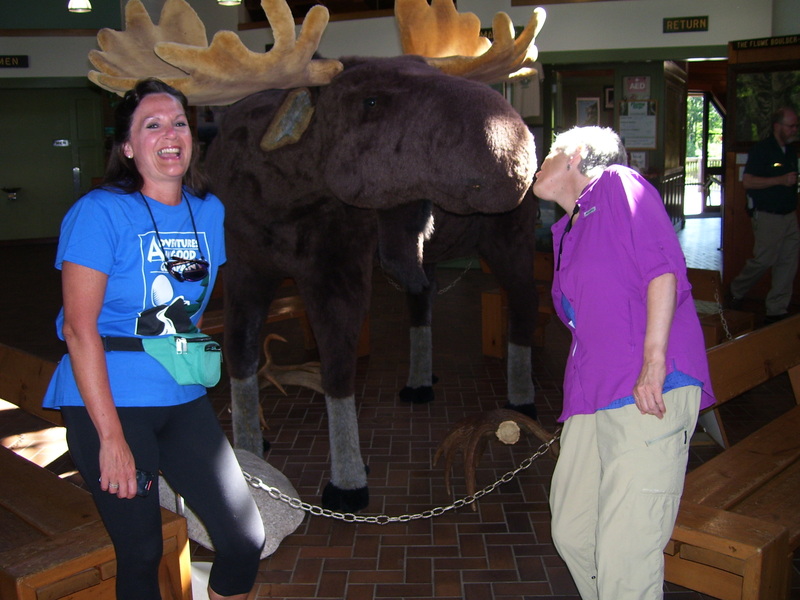 We all drive to the beginning of the hike 45 minutes away – only to find we’ve left Cindy behind at the condos!! Once it’s decided that she is NOT in the bathroom, or hiking on her own, Ruthie pops back in the van to go get her, and we all commence on our hike on the Zealand Falls trail. 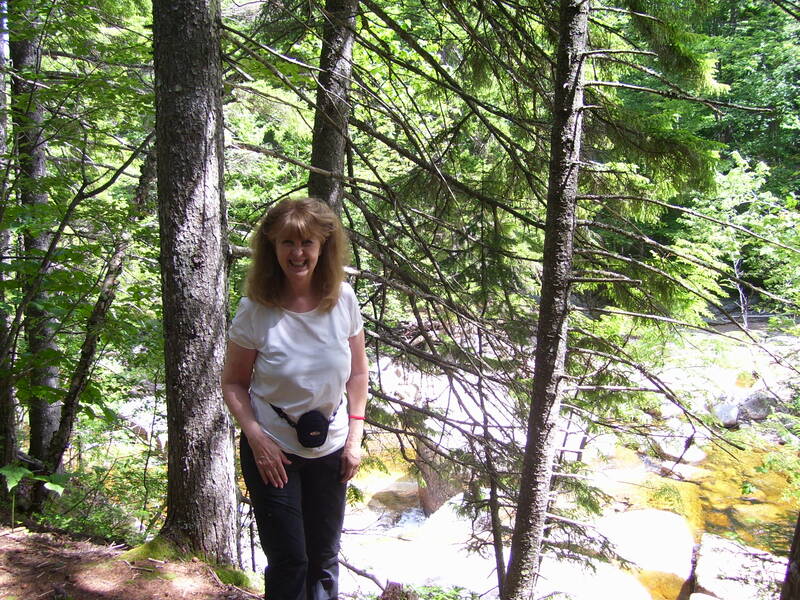 A glorious hike through forests and past marshes, alongside the Zealand River. We see beaver dams, waterfalls, beautiful ponds, serene woods, blue sky, fluffy white clouds…manna for the soul. 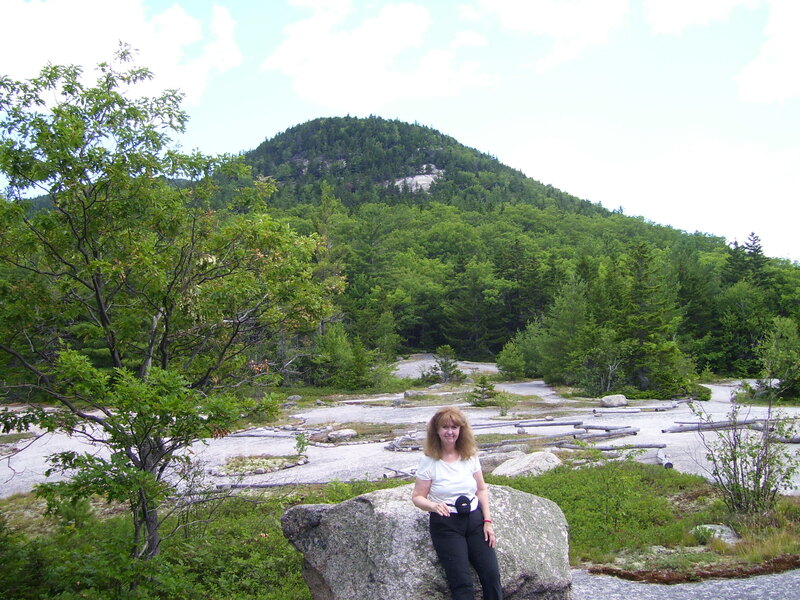 During this hike, we actually get onto the Appalachian Trail, and are hiking to one of the AMC huts which has an amazing view from the rocky crags surrounding the waterfall. The vistas all around us are breathtaking…so much green and blue, you want to kiss the ground for the pleasure of knowing these places still exist in the world. 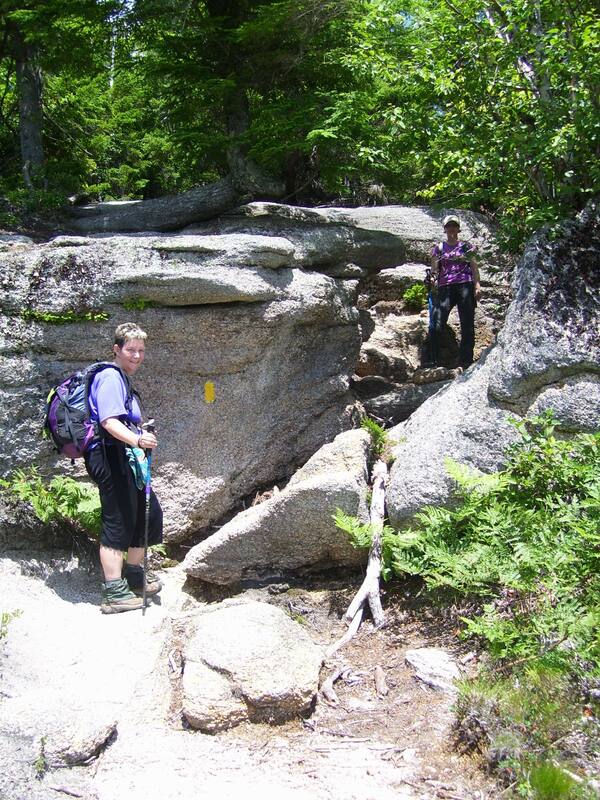 The last stretch of this hike is boulders, boulders, boulders…huge and challenging. Here we take a break for lunch, scattering ourselves over the boulders and enjoying the breeze. 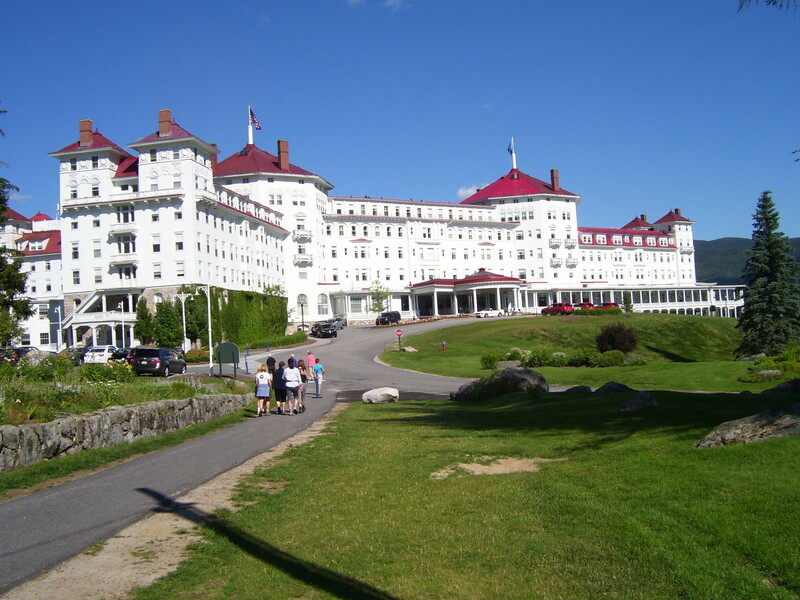 After this hike, we piled in the vans and drove to the beautiful and historic Mount Washington Lodge – historic because in 1944 it hosted 44 nations at the Bretton Woods International Monetary Conference, where the World Bank and International Monetary Fund were established, with the US dollar designated the basis of international exchange. This lodge is absolutely gorgeous…the hotel, the grounds and the views…perfection. 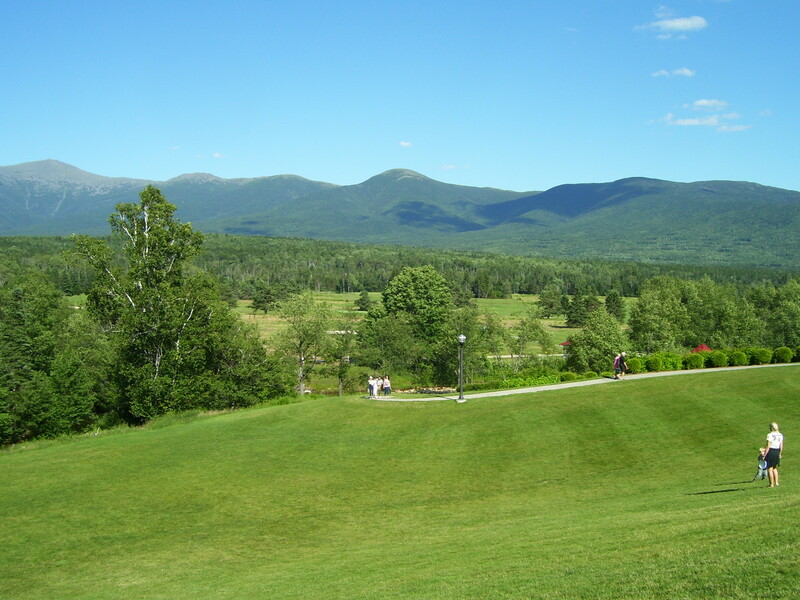 We sat on the veranda or in Adirondack chairs on the lawn overlooking the mountains beyond, drank our lemonade and thought ourselves some of the luckiest people on earth. Then it was back to our condos for a home-cooked dinner (barbecued pork chops, salad, chocolate)…and I had my usual one beer. Tomorrow we leave earlier than usual…and so , to bed. Good breakfast at 7:30 and we are out the door by 8:30, on the way to the Saco River for a day of canoe-ing and kayaking. 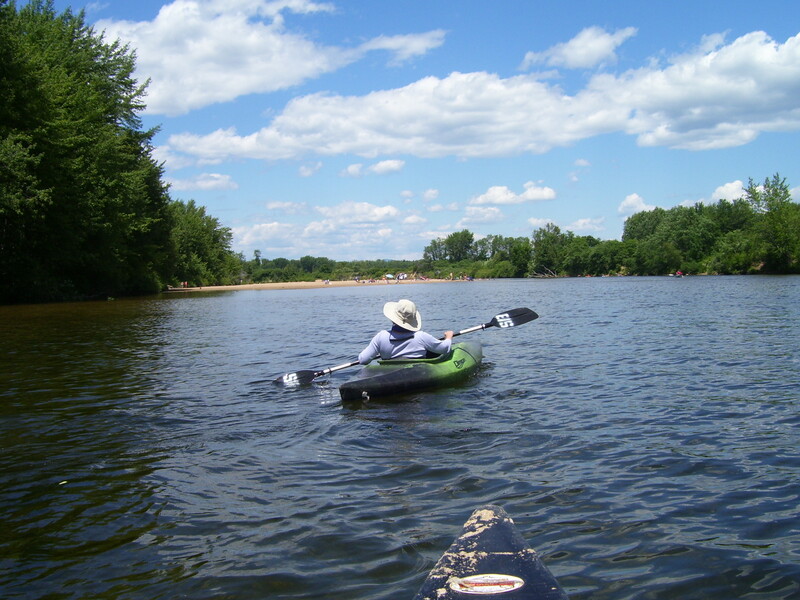 Four canoes are booked, two kayaks. 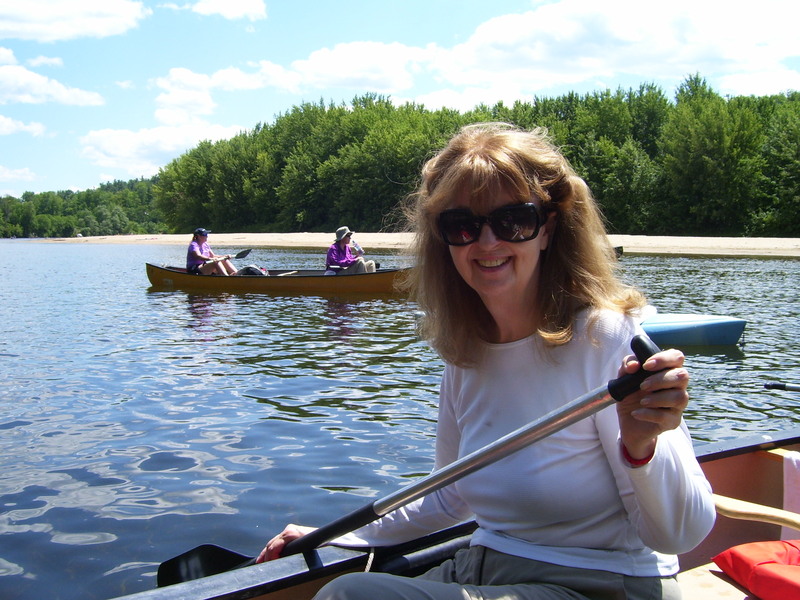 Deb and I hope to partner in one of the canoes – NOT the greatest idea in the world, as we keep driving the canoe into sandbanks. So Deb and Jan exchange places, and we’re finally on our merry way. Just before I got overturned! 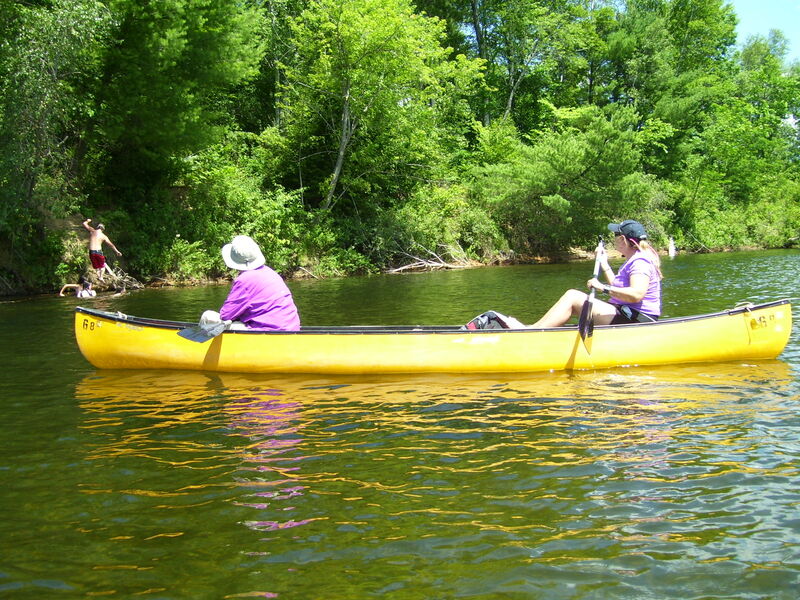 Time to return to the canoes – Jan and I crawl in, and then, somehow, we locked our canoe with another – and the next thing, we’re both in the water…soaked. My camera was encased in a waterproof pack – the only thing not soaked through. Onward we paddled for another hour…another break…then we arrived at the dock, at 3:15. Unloaded everything, and then we all piled on the bus, back to town, where we stopped at an ice cream shop for a cone and a rest. The ice cream was yum-o (me? I had traditional chocolate chip…) Then it was back to the condos, quick clean up, nice meal cooked by Jan and Ruthie…and so to bed. Heavy duty hike tomorrow! 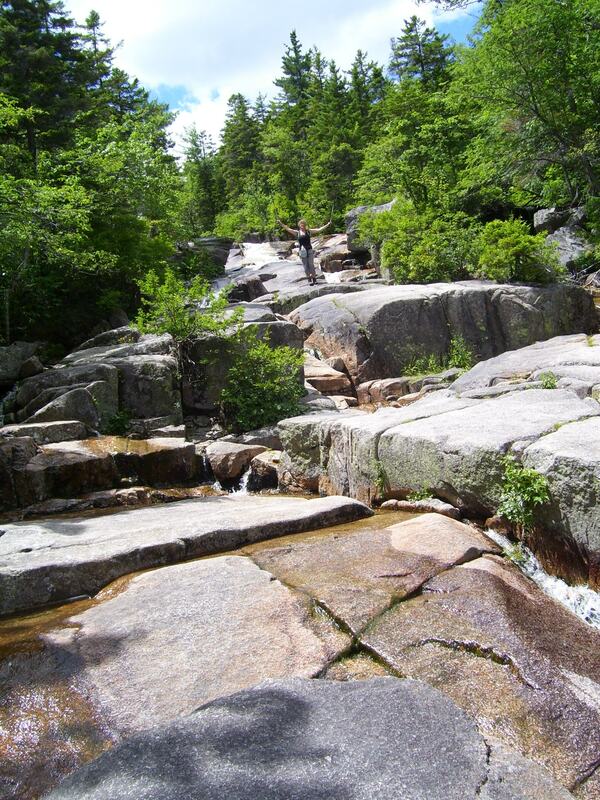 This was the most difficult hike of all for me. 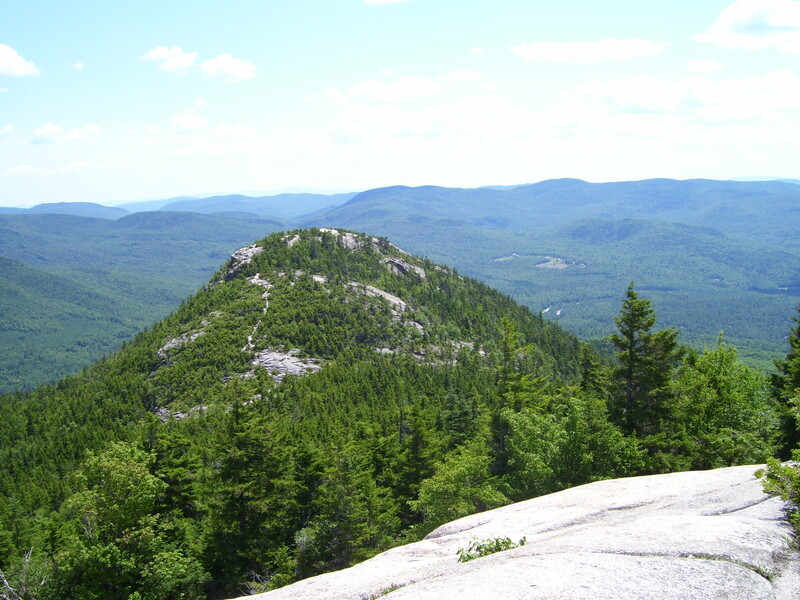 We left the condos around 9AM – usual hearty breakfast, pack our lunches…and drive an hour to the start of the Welch-Dickey hike in the Waterville Valley (Welch and Dickey are actually two mountains), where we will achieve two summits. Jan wrapped my and Ann’s toes in duct tape – worked super-well to prevent blistering or cutting. 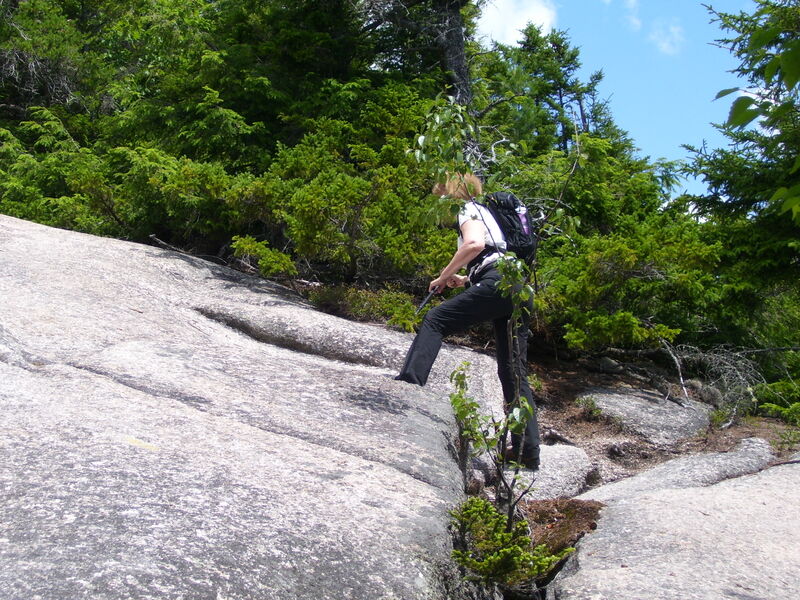 I came without poles – will never do that again on a hike of this nature! 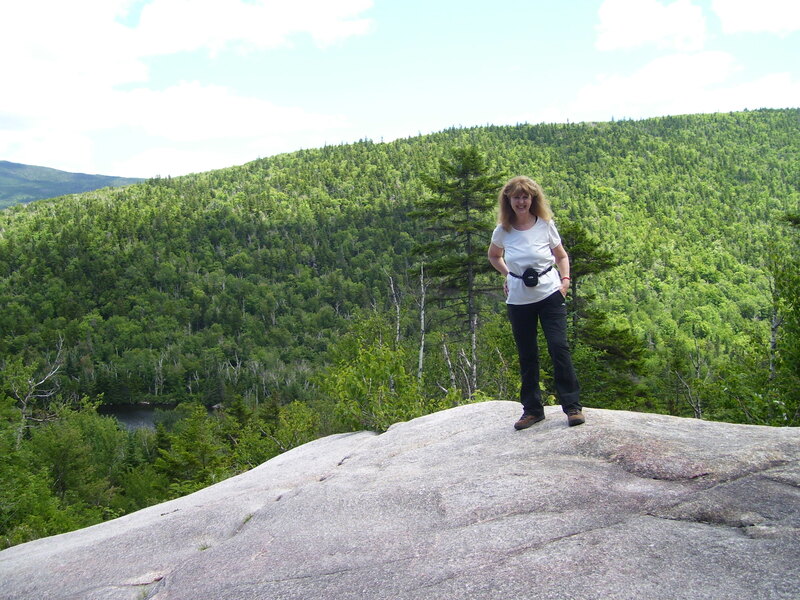 The hike was uphill all the way to Welch’s peak (no little flat places to take a breather) – not high, but strenuous…with much of it “scrambling” or climbing over humongous granite boulders to the very top. Who knew I could do this! 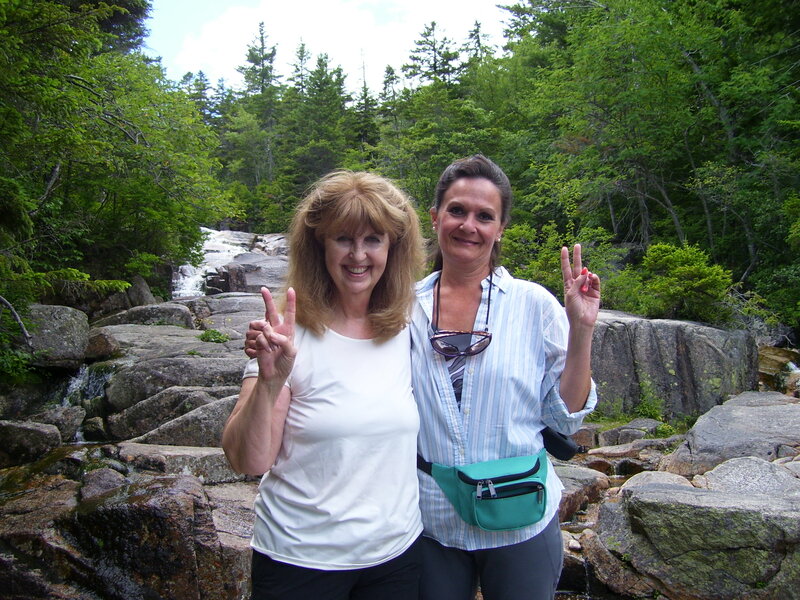 I take it easy up this trail so as not to wear myself out (recommendation from Jan – sounded good to me), but Jan and Rebecca hang in with me, which I much appreciated. At the summit, I gracefully tripped on a tree root, went down on my knees on soft trail with a splat. But nothing to really write home about (although I hate falling). 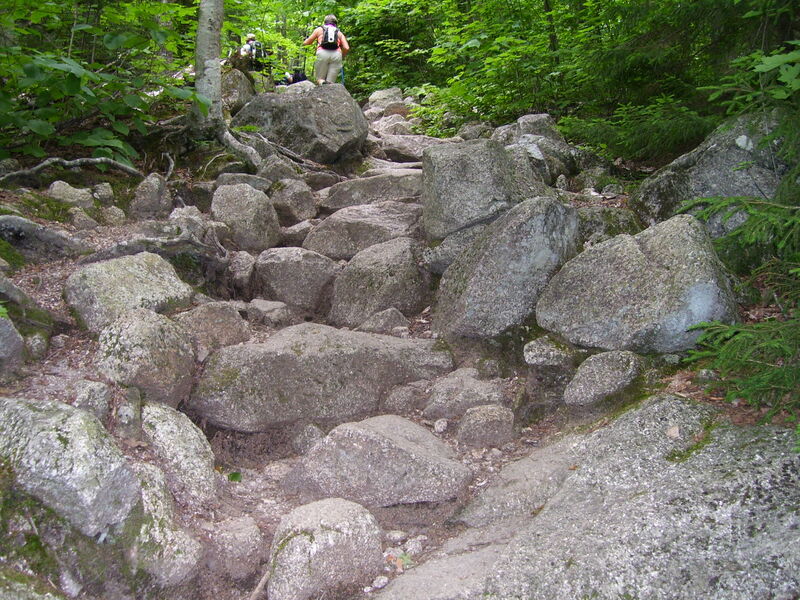 The trail from base to peak was a mixture, actually, beginning with fir-lined paths with a few rocks and boulders…then climbing steadily upward to the huge monoliths halfway up Welch. We took a few breaks for lunch, snacks, water and photography. I was sweating hard by the time I reached the peak…but the views, absolutely incredible! Looking down from our viewpoint atop granite, across the valleys filled with firs, maples, birches and other trees, to mountains ranged along our field of vision…and the vast sky overhead…all is so still and peaceful. 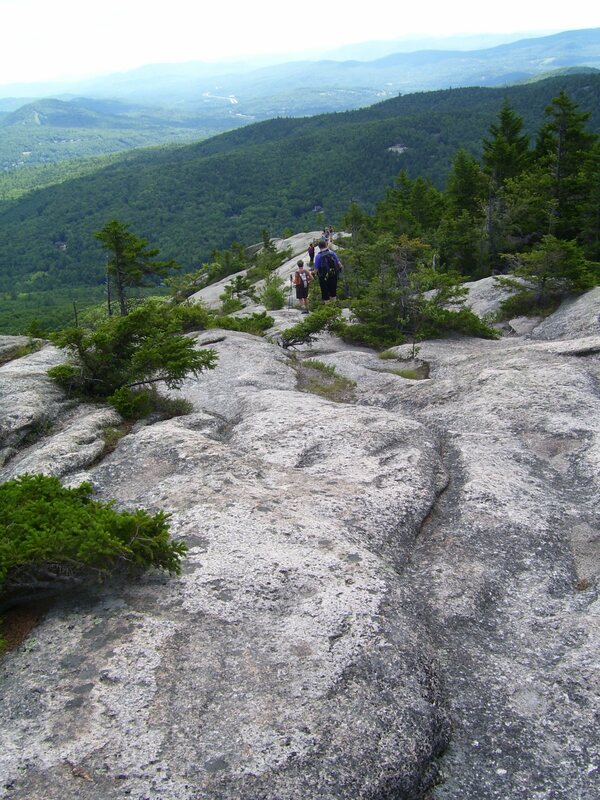 Of course, if you happened to fall off the granite, it was a loooong way down. Must try not to do that! After stopping a few minutes on Welch, we headed down and onward to Dickey’s summit, about 1800 feet, all in all. Now we’re back in the condos, and most of the group has gone to the Bathtub for a quick swim. Then it’s on to the Gypsy Café for our farewell dinner…the food there is fabulous! Up and out of the condos, packed and ready to go by 9. One more short hike, at the Flume Gorge, about 800 feet long from the base of Mount Liberty. The granite walls rise to 70/90 feet and are studded with ferns and tiny vines and flowers, while the water drips everywhere…we take a 2-mile walk over boardwalks and gravel. Lots of people visiting, whereas on previous trails, very few. A quick lunch, and it’s time to say goodbye. After great conversations, good food and drink, the incredible beauty of the wilderness…I am ready to go home and mull over all the experiences. Back to civilization, back to real life. Just want to add a couple of books that I highly recommend: Bill Bryson’s “A Walk in the Woods” – so funny and a terrific source of information about the AT. And “Wild” by Cheryl Strayed – I loved this book about her hiking the PCT, the reasons why she did it, and what she found out about herself at the end of it all. Couldn’t put it down. Posted in Uncategorized and tagged A Walk in the Woods, A Walk in the Woods the White Mountains, A Walk in the Woods the White Mountains of New Hampshire, Adirondack chairs, AMC huts, Appalachian Trail, Bill Bryson, boulders, Bretton Woods International Monetary Conference, canoes and kayaks, Cheryl Strayed, duct tape, Flume Gorge, granite, granite boulders, Greely's Pond, Gypsy Cafe, Hiking the White Mountains of New Hampshire, k White Mountains Visitor Center, Kancamagus Highsway, kayaks, Lincoln NH, Loon Reservations, Mount Washington Lodge, New Hampshire, New Hampshire and A Walk in the Woods, poles, Saco River, scrambling, the Bathtub, Upper Greely Pond, Waterville Valley, Welch-Dickey Mountains, white granite, White Mountains, Wild, World Bank and International Monetary Fund, Zealand Falls, Zealand River. Bookmark the permalink.